The What: Symetrix has launched the Prism 0x0, the latest in the company's Prism series of Dante-enabled DSPs. Offering expansion via 64 channels of bidirectional Dante networking, the new Prism 0x0 delivers cost-effective processing, mixing, and routing for Dante-enabled endpoints, while providing high sound quality. The What Else: The Prism 0x0 is identical to the other Prism DSPs (and to Symetrix Radius and Edge products) with respect to processing power and delay memory. It is unique in that it has no analog inputs or outputs and no external control inputs or logic outputs. Prism 0x0 provides a quick way to add customizable DSP capacity to existing Dante-enabled systems. Housed in a 12 rack x1U rack-mount chassis, Prism 0x0 includes flexible mounting options and convenient power over ethernet (PoE+). "The Prism 0x0 has many applications," said Symetrix senior product manager Trent Wagner. "For example, a lot of digital consoles have Dante but don't offer feedback elimination, auto-mixing, and FIR filters for processing loudspeakers. Simply insert the Prism 0x0 between the remote stage-input boxes and the console, if Dante-enabled, or use the Prism 0x0 as an insert or bus processor. For outputs, relay the signals through the Prism 0x0, if the amps are Dante-enabled, or insert it on the console's buses." Wagner also noted that in a multiroom meeting or conferencing facility that is all Dante based, you can save money by centralizing and sharing certain resources. A Prism 0x0 in each room handles the local Dante mic and speaker processing, while Symetrix Radius and Edge DSPs in the central machine room manage the AEC, mixing, and mic routing and assign resources such as telco lines. "The Prism 0x0 is also a great solution in a larger system where you just need to add some extra processing or signal aggregation," Wagner said. "Choose it if you need loudspeaker processing for a bank of amps at the scoreboard and Jumbotron in a sports stadium, or if you need to aggregate a bunch of wall-panel I/O boxes in a convention center in order to reduce the number of network home runs." 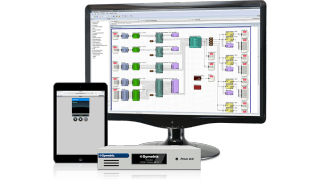 Like other Prism-series DSPs, Prism 0x0 can be customized, connected, and configured using Symetrix Composer, a Windows-based CAD program. Prism 0x0 can be controlled from Symetrix ARC wall panels, ARC-WEB browser-based interface, and from third-party touchscreens. An embedded web server enables remote audio metering and diagnostics of the Prism 0x0 hardware. Prism 0x0 features an OLED display, as well as ARC, Dante, and ethernet ports. The Bottom Line: Used as the DSP core of a Dante network, or as a DSP co-processor, Prism 0x0 is well suited for applications requiring powerful, cost effective, advanced signal processing coupled with an industry-standard network audio interface. "Thanks to its open-architecture flexibility, future expansion capability and top-notch sound quality, the Prism series has become a go-to component in the integrator's toolkit," said Symetrix founder and CEO Dane Butcher. "The new Prism 0x0 is the most powerful Dante-enabled, open-architecture processing node on the market. Its 64x64 Dante implementation and powerful DSP reduce system costs so that, combined with compatible Symetrix I/O expanders and control products, it enables integrators to deliver high-performance systems at an amazing price point. Prism 0x0 is a great solution for commercial, corporate, house of worship, education, and government installs alike."